These are all castings from my originals , made for my own figures. 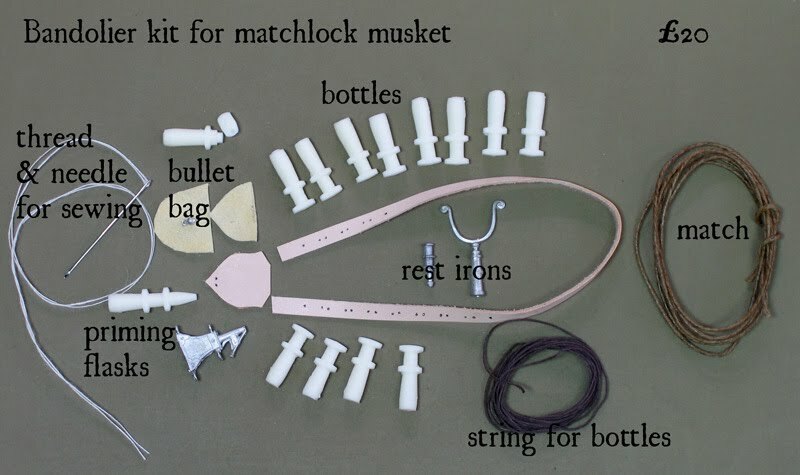 These kits cover obscure early weapons which are never going to be made by the commercial manufacturers . They are produced in very limited numbers, since the demand is so low, and the price has to reflect this. 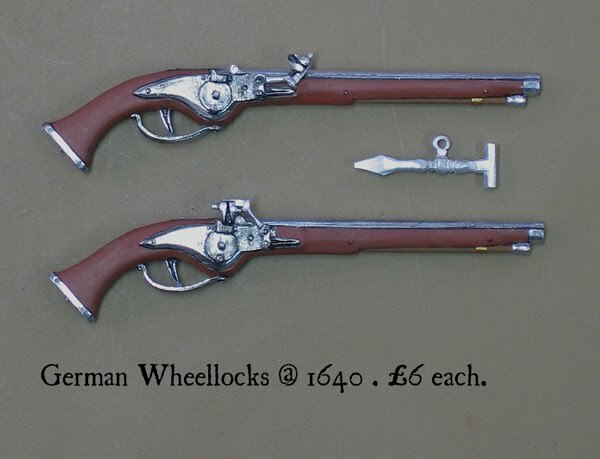 But if you want a really accurate musket , I hope you will be pleased with these. The resin parts are made for me by Dave Dibb of Armorpax and CMA , who also do my heads, and I cast the pewter parts myself. All sold as kits , requiring some cleaning up and polishing , and of course painting. Postage is extra, but at cost. 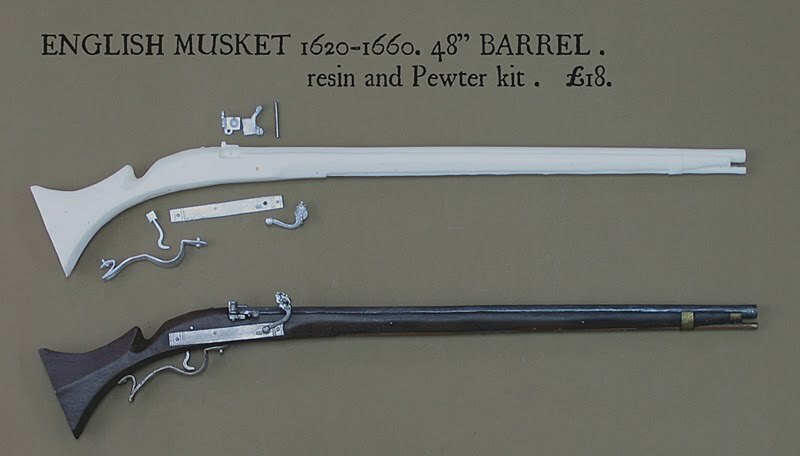 Long Land Pattern Musket : The first standardised firearm issued to the British Infantry from around 1720, with the full length 42" barrel and wooden ramrod. Used throughout the French & Indian Wars and the Jacobite Rebellion. Resin & pewter kit, £16 . sides during the American Revolution. Resin and pewter kit , £15 . India Pattern Musket : originally made for the HEIC, but became the economy model produced in millions during the Napoleonic Wars . 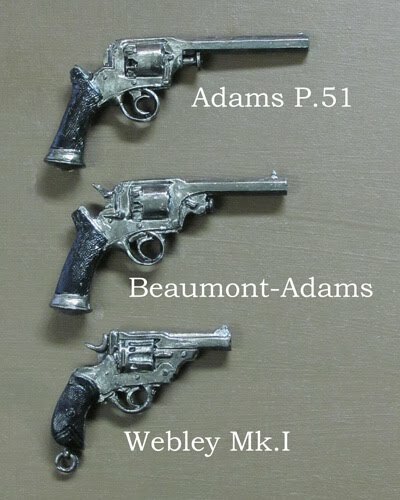 Standard model for British Infantry 1800-15 . Resin and pewter kit , £15 . 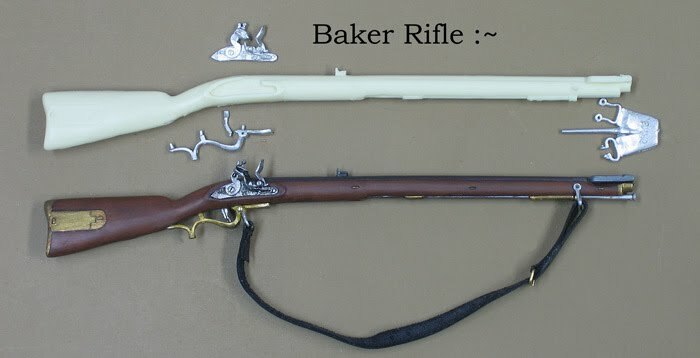 Elliott Carbine : the standard issue weapon for Light Cavalry during the earlier part of the Napoleonic Wars , suitable for the DiD British Hussar figure . Resin and pewter kit, £15 . in British Service . Copied from an example in my local Museum . Resin and pewter kit , £15 . 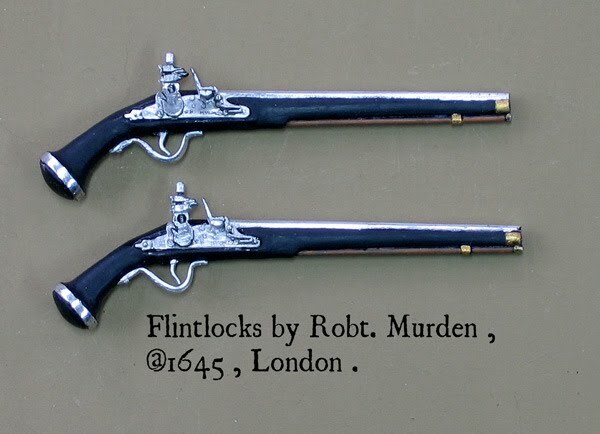 English Flintlock pistol : by Murden of London , dated 1645 , this is one of the earliest types of flintlock produced. 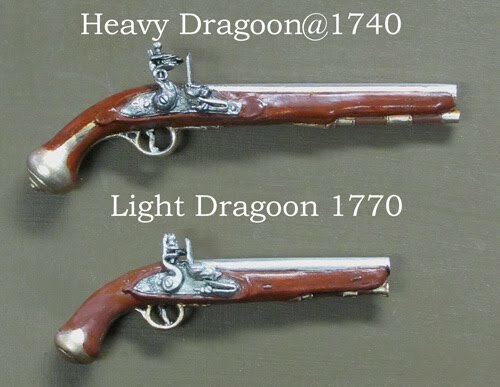 I have now made two types of flintlock Dragoon pitols , both suitable for all sorts of scenarios. These are £5 each unpainted . and the Webley Mark.I , first of the famous series, first available in 1887. The Mark II was very nearly identical. The Minie Rifle : the P.51, the first rifled arm issued to all Infantry, just in time for the first battles of the Crimea. It is externally identical, apart from the backsight , to the percussion Muskets of 1839 and 1842, so can stand in for those ( Sikh Wars etc ). £15. The Martini-Henry : Immortalised in the famous actions of the Zulu War , but also the mainstay of the Army in the Afghan and Egyptian campaigns.My version is heavier than the commercial ones, and thus I hope more accurate . £15 . 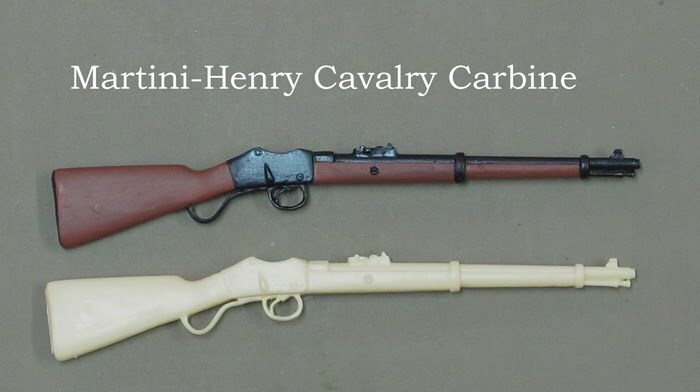 Martini-Henry Carbine : the cavalry equivalent. £12. Lee-Metford Rifle : The first magazine rifle, in the new calibre of .303" , issued from 1888 and used in the Sudan and the North-West Frontier. 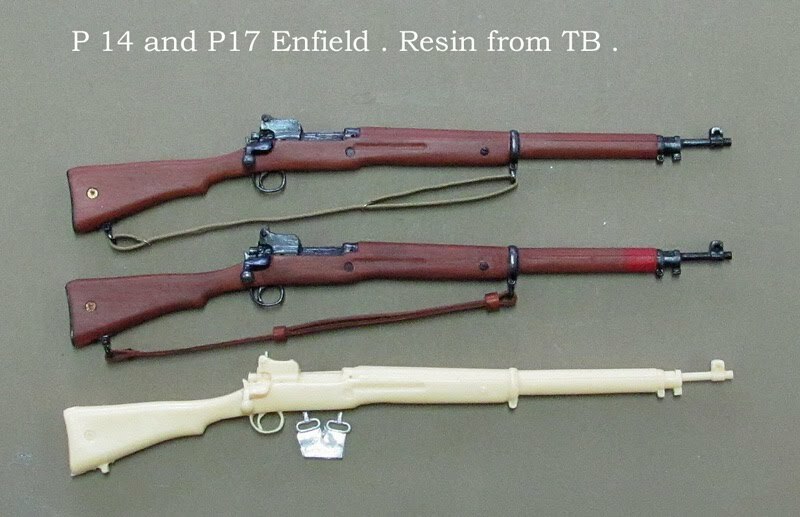 By filling the stock grooves and replacing the cocking piece( supplied ) it can easily be converted to the Lee-Enfield of 1895. Resin & Pewter kit, £15. By filling in the stock groove, and changing the cocking piece, this model can give you the Long Lee of the Boer War. Charger Loading Lee Enfield , as issued to Territorials for the first two years of the Great War :£15. 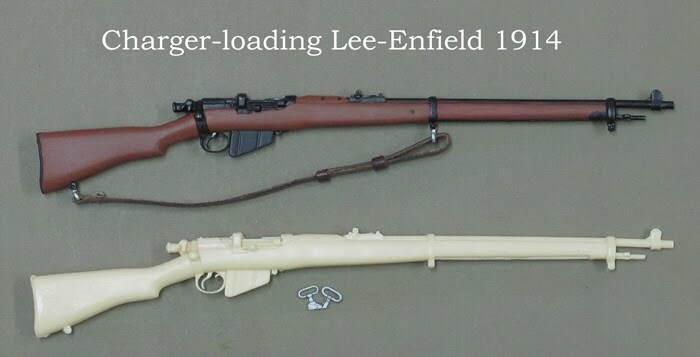 The P.14 and P17 : an alternative .303 design to the Lee-Enfield, in the event made in small numbers for the British in the US and used by snipers in the Great War. Taken over by the US Army and made in .30cal for their own troops, but rarely issued. In 1940 imported in millions back to a desperate Britain to arm the Home Guard :£15.